So, we decided that seeing as Sweden keeps coming up with new fancy versions of Semlor, we needed to have a go, too. The traditional Semla bun (Semla is singular, semlor is plural) is a cardamom yeast bun, filled with marzipan, whipped cream and dusted with icing sugar. Traditonally eaten around Lent – especially on Fat Tuesday (you may know it as Shrove Tuesday) – Semlor are the most delicious thing ever invented. We start serving them in January and we stop around Easter. 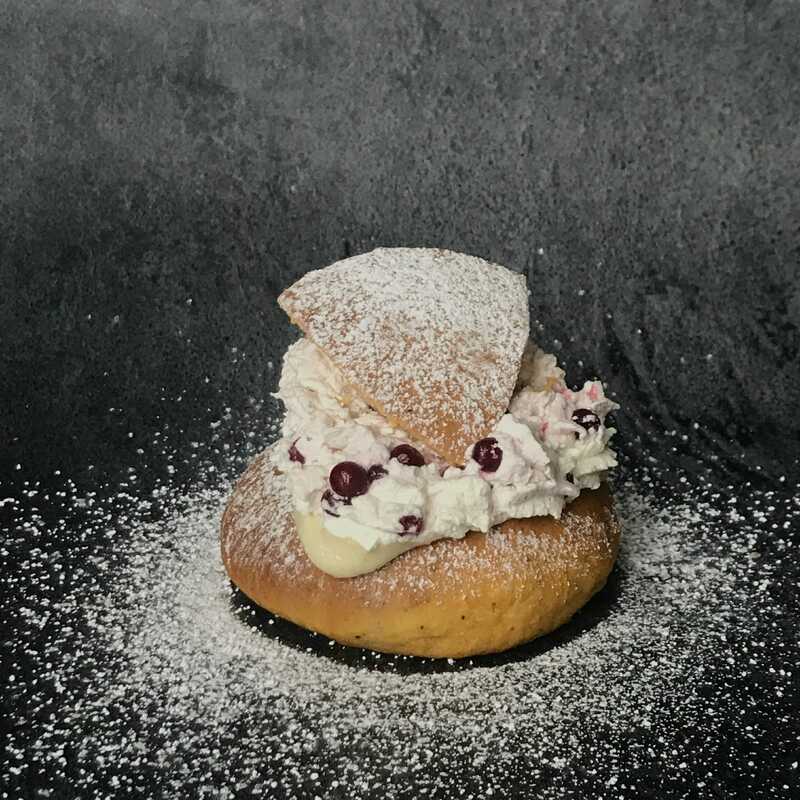 Here is our best recipe – Classic Semlor. 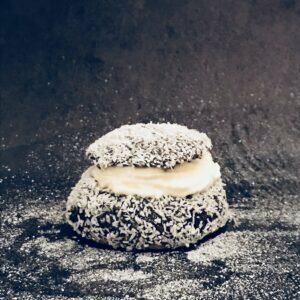 It used to be illegal to serve Semlor outside of season. Swedes LOVE seasons. Crayfish season is August, Eurovision season is May and Semlor is around February (depending on when Lent and Easter falls). Only bake and eat these in season. 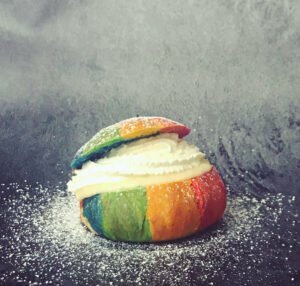 So, every year, bakeries in Sweden compete to come up with NEW Semlor. Even though, to be fair, people really just mostly prefer the original one – but once you have eaten 4 or 5 of those, a bit of variety is good. So, we decided to come up with some different ones, too. 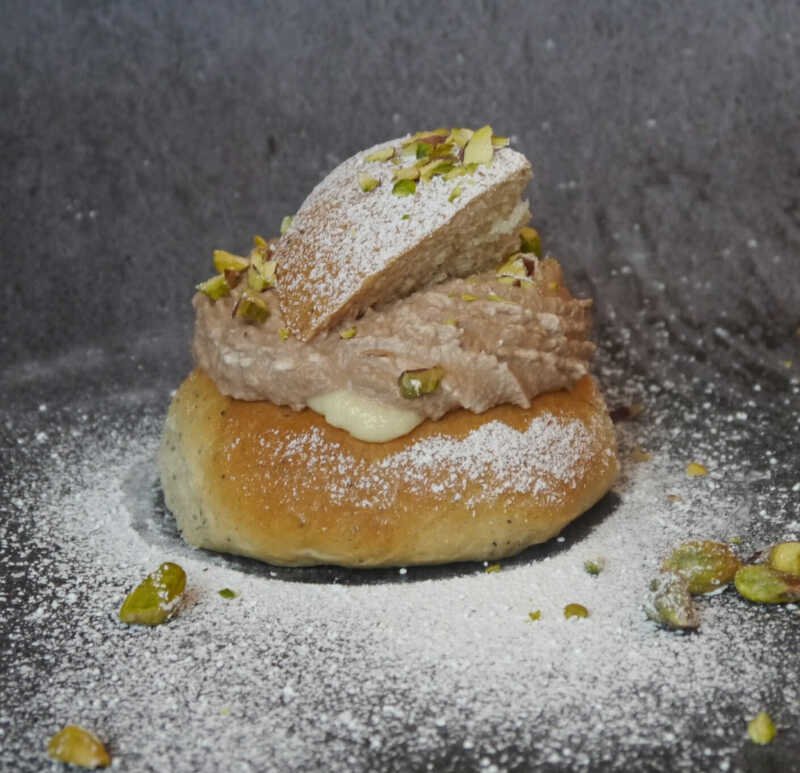 All of our semlor have cardamom flavour and keep to the main traditional flavour notes. 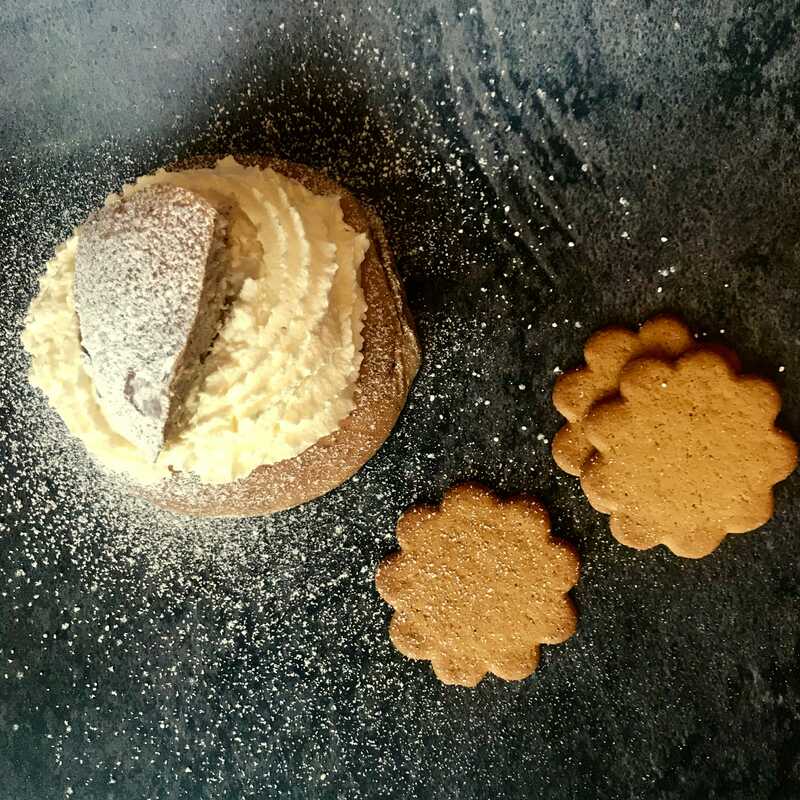 Some we have been inspired by via other bakeries in Sweden – and some are our own creations. 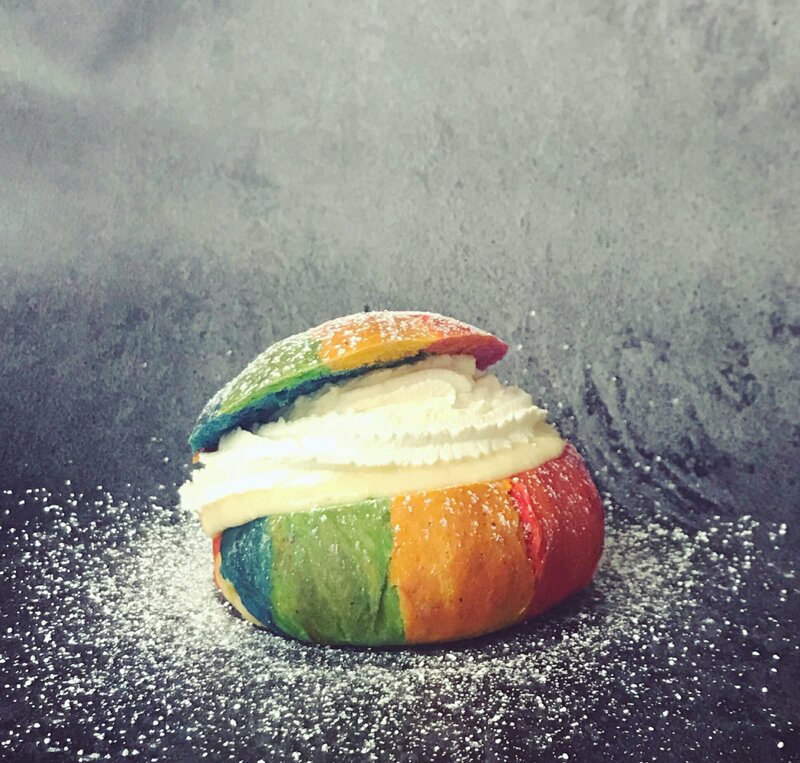 We’d love to see what YOU can do – have you got an idea for a hybrid semla? We want to see a photo and hear all about it! Send us your suggestion before Fat Tuesday and you will be in with a chance of winning is big gift basket from our shop full of treats. Send your entry to iloveherring@scandikitchen.co.uk. Usual rules apply. This is our favourite from our testing day. It was pretty hard to make, seeing as we had to colour the dough, then roll it and then twist it and make sure it baked properly. We kept the filling original, but added glitter to the whipped cream (although you can’t really see it in the photo). We like to claim this one as ours, as we have not seen anyone else make #PrideSemlor. So there. We added lemon zest to the dough and lemon zest to the marzipan filling. Then a dollop of lovely lemon curd and whipped cream. Oh yes. 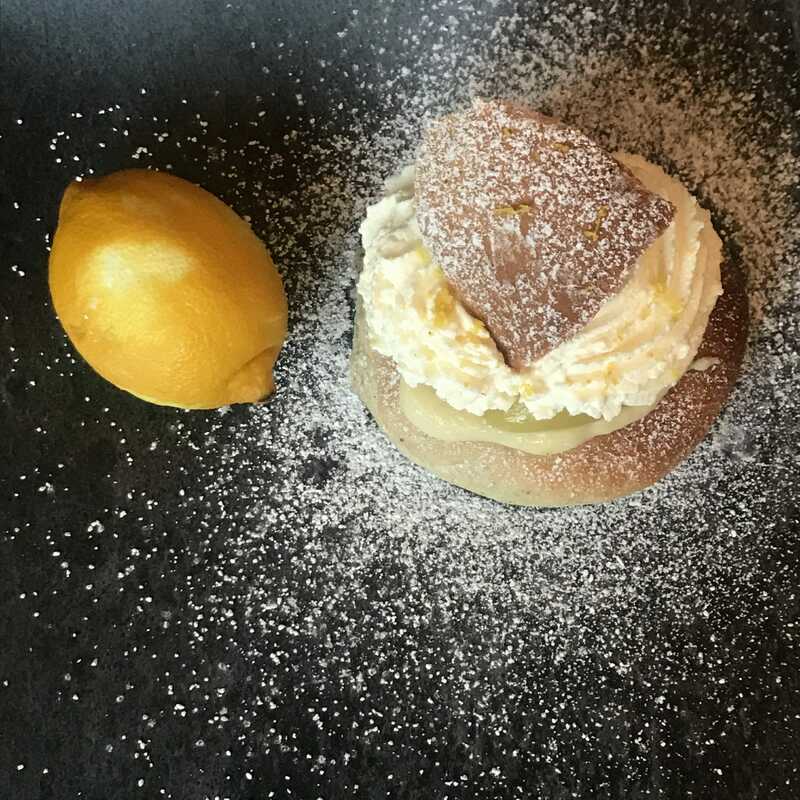 Hail the Lemon Semla. This is almost a classic combo all over Sweden. Add saffron to the dough and it goes super yellow. Add the usual marzipan filling, but also add some lingonberries to the whipped cream. The tartness is wonderful against the sweet saffron flavour and marzipan. We haven’t seen these before, but we’re pretty certain we’re not the first to make these! Delicious, totally over the top, too. 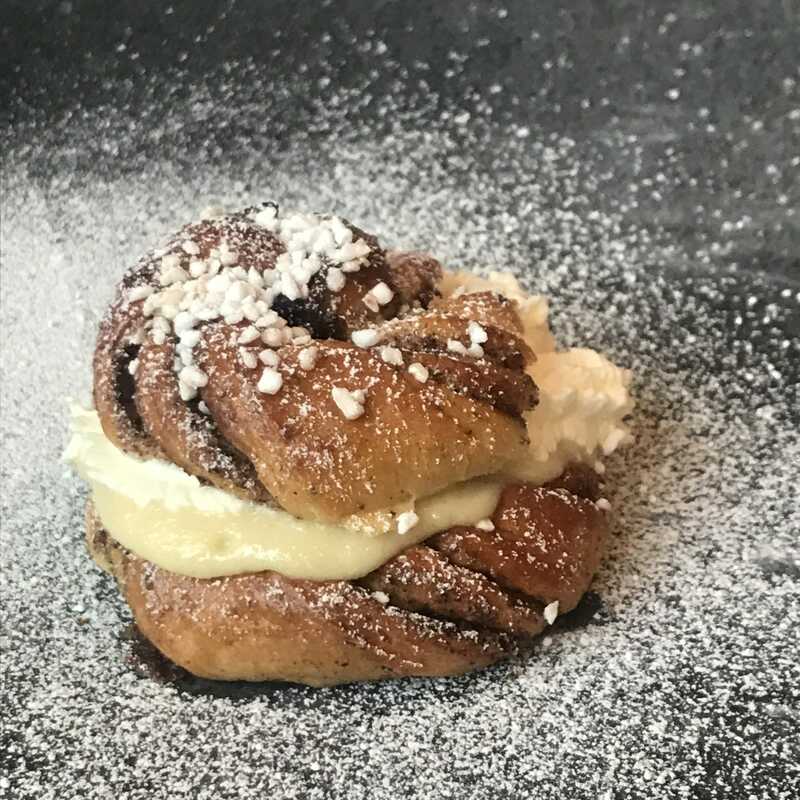 A cinnamon bun, split in two, filled with marzipan and whipped cream. D-licious. 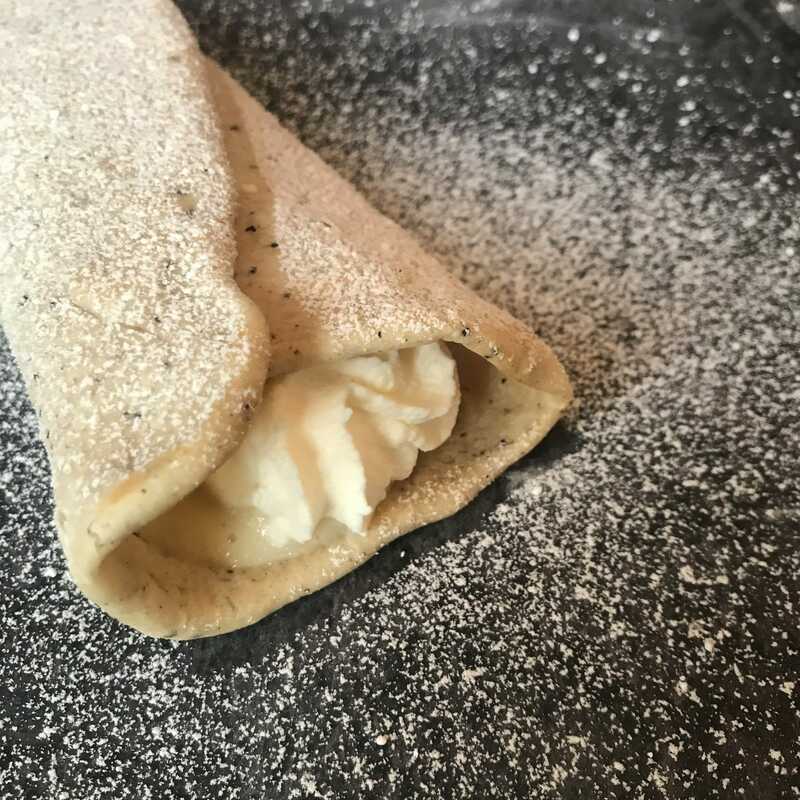 We added ginger biscuit spice to the dough (very nice), spice to the marzipan filling too – and vanilla cream and topped with a few Pepperkakor ginger thins. Not bad at all. 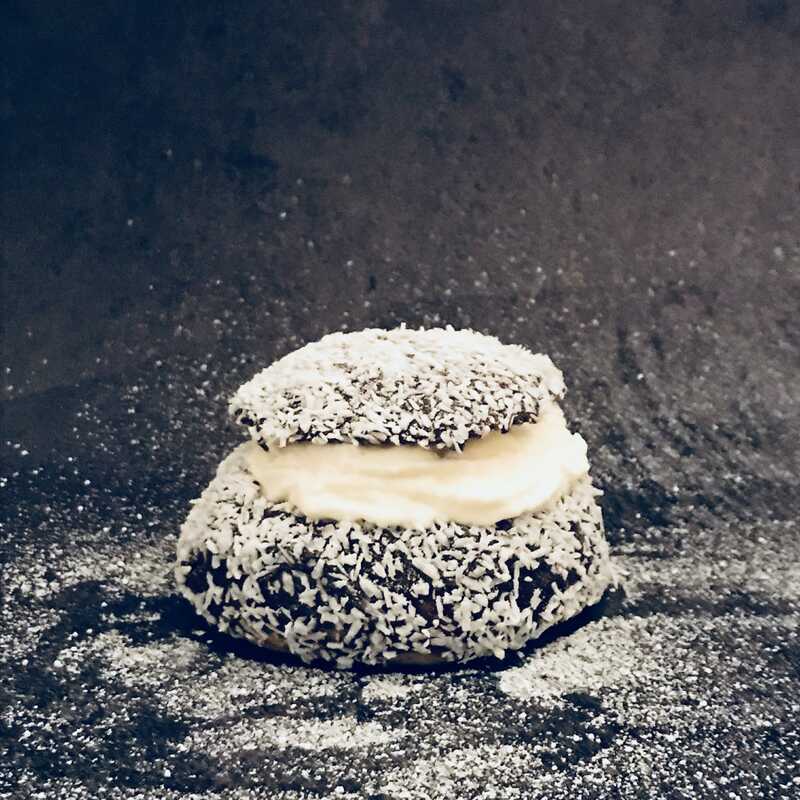 If you’re going to be Aussie about it, it has to be Lamington. We covered the bun in chocolate, we rolled it in coconut. We added a bit of jam under the marzipan filling and filled it with cream. We saw one like this on the internet a while back but we can’t find it so we can’t tell you who did it first. 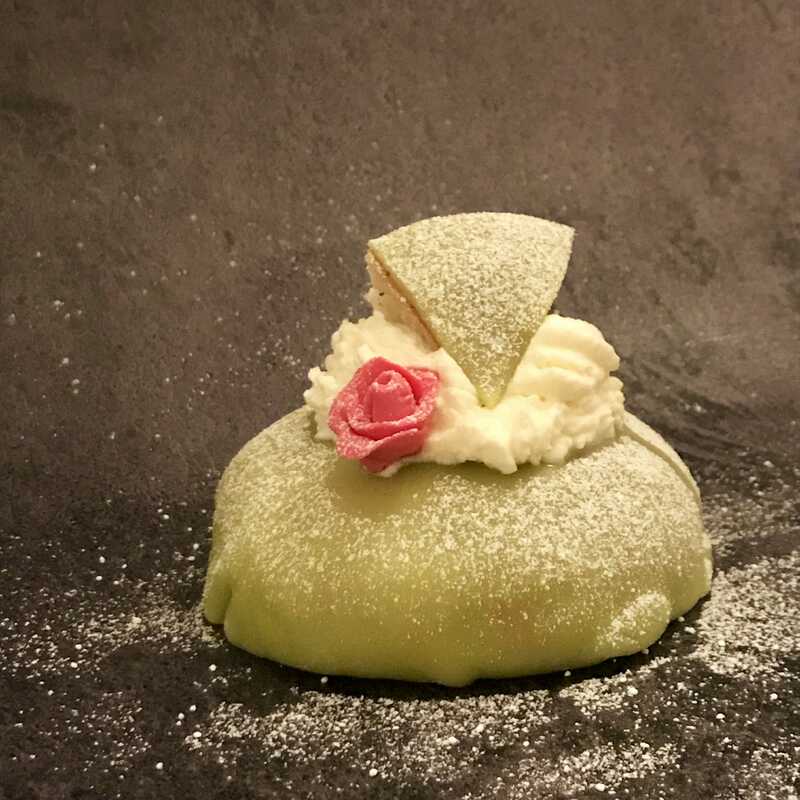 A Mozart Treat in Sweden is marzipan with pistachio, nougat and chocolate. Oh lord, this one is delicious: We added chocolate to the whipped cream. We added nougat above the marzipan. We added chopped, toasted pistachios. Mozart would have liked this. Actually, this is for the Norwegians. In Norway, people love mixing cloudberries with whipped cream – it is called Multekrem. So, this is what we did: This baby is stuffed with marzipan and Multekrem. Oh yes, it’s good. Thumbs up from here. We didn’t come up with this one. A bakery called Tossebageriet did, a few years back. It is a semla dough, but made as a wrap – and the marzipan and cream is inside. Not bad, although it is a faff making loads of the round wraps. Looks very different, though, which is great. We changed the dough to a choux dough – and added ground cardamom. We them opened it up and filled it with marzipan and whipped cream and topped with a dark chocolate icing. Bronte ate this and wanted more. It’s a yes from us. 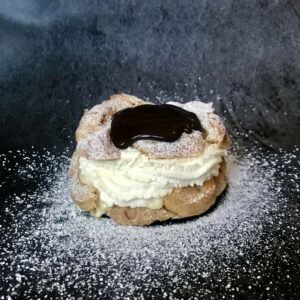 Profiterole Semlor for the win. This was the craze of 2017. It was everywhere. We made hundreds of these at the café. They are amazing – but it IS a lot of marzipan. Marzipan inside, marzipan outside. Cream and a little rose. 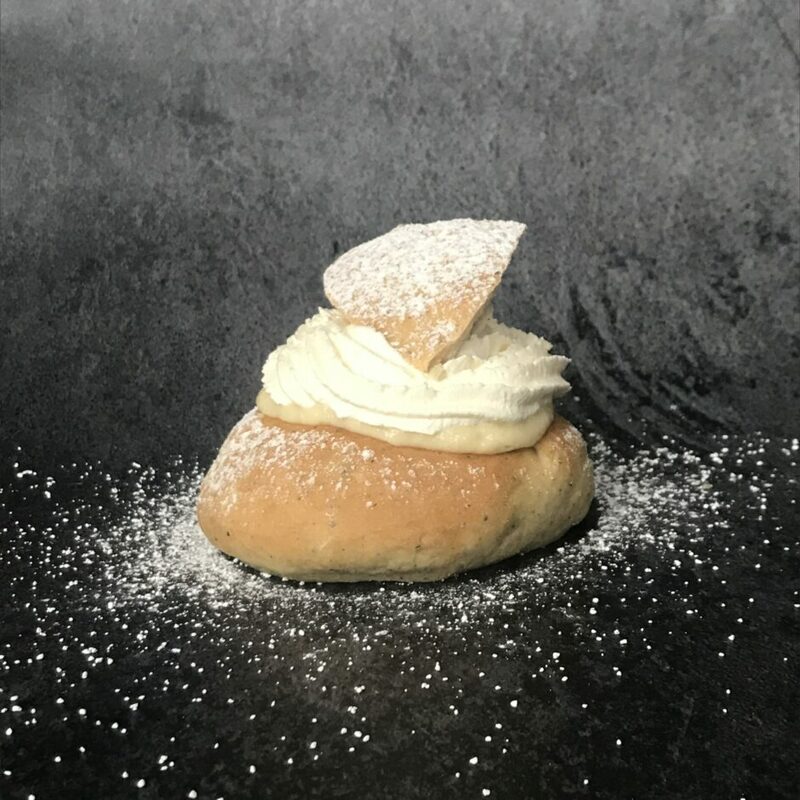 The cutest semla of them all. We added chocolate pieces and cocoa to the bun. We added chocolate to the marzipan and then added nutella on top of that. Then we melted nutella and whipped it into the cream. Did we mention that there is a lot of chocolate in this one? 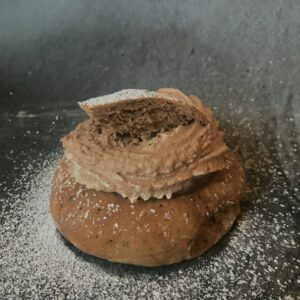 Choc choc choc semla. Seriously, we are aware the photo is a bit rubbish. We were trying to make sure there was enough salted caramel in this one. There is, we can testify to this. Salted caramel inside, outside and in the cream. We love salted caramel. It works. This is the craze of 2018 in Sweden. We were not convinced, to be honest. 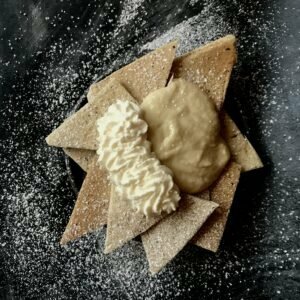 Who wants Semlor chips? Actually, we made this and it’s pretty good. 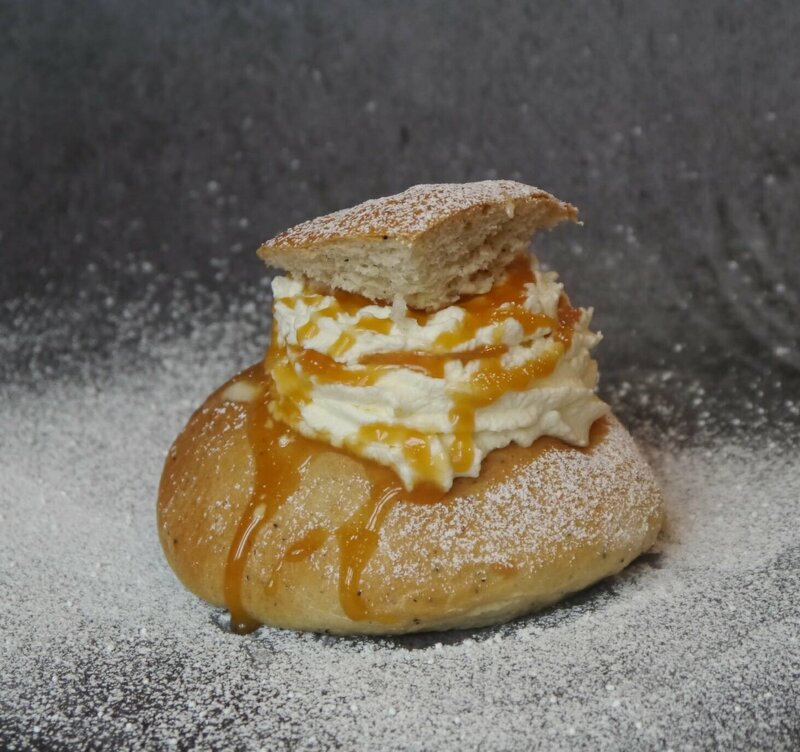 You can sit and eat a semla on the bus like this. In the cinema. In the office. 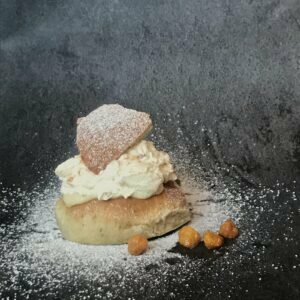 It’s a snack-semla and we quite like it. Yeah, it’s a faff to make the chips (roll out, bake until almost done, use a pizza cutter to make the chips, back in the oven to dry a bit). But not bad at all. We love this one. 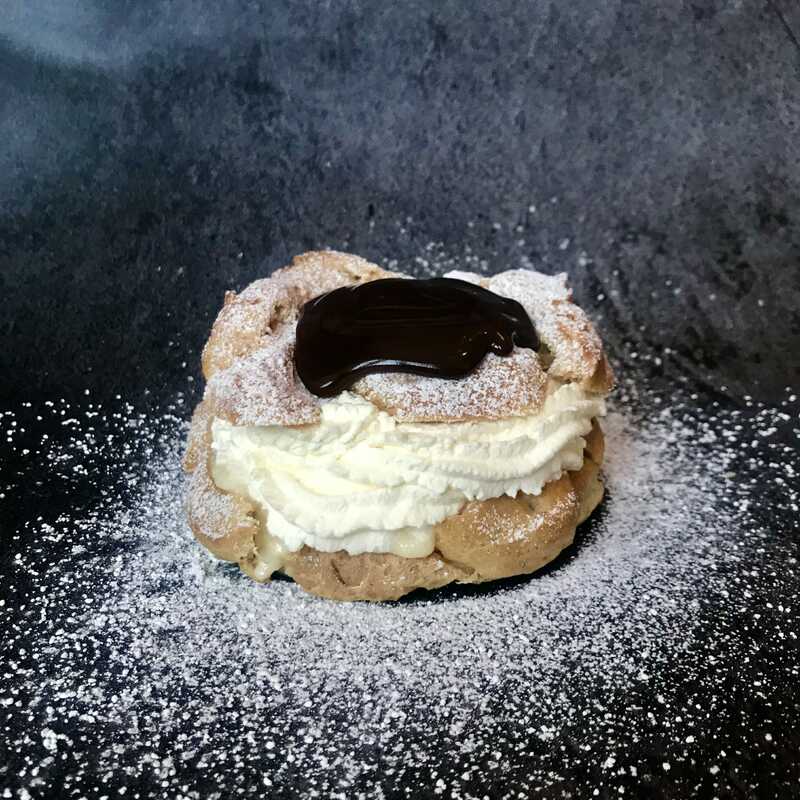 The one we hold close to our hearts: Big bun, lots of marzipan, cream and a dusting of icing sugar. Who could ask for more? Don’t forget to send us your ideas. Maybe you have ideas for a hybrid of a British cake with a semla? Hot Cross Semla, maybe… or Bakewell Tart Semla. Sticky toffee Pudding semla? We look forward to hearing from you.